Love this candid photo of Doris! Incidentally, with respect to your encounter with Kirk, this reminds me that the "I'm just doing my job, sir" line has been directed at me on numerous occasions. It generally makes me see "red".. Their interpretation of what their job entails (usually security guards) involves harassing people to their heart's content.......Sorry for the rant. Nope DGF, I was one of THE nicest airline agent/supervisors you or ANYBODY was ever going to encounter. Well, UNLESS you'd get "in my face" anyway, and then I COULD of course play "the bad cop" routine VERY well on that kind of individual, ya know! You guys can bash Kirk ( in a good natured way ) but are you aware that many years ago he and his wife set up the Kirk Douglas Foundation that has given away millions to needy organizations, they are responsible for having 100's of playgrounds built in slum areas. they have given away countless millions of dollars of their OWN money. They donate worldwide. They are generous humanitarians. Dargo, I think when Kirk said so you know who I am he probably meant, I'm not some nut asking you, you know who I am. Isn't that possible? I wasn't "bashing" Kirk down there, lavender. All I was doing was relaying to you MY OWN firsthand experience with the talented Mr. Douglas, and even though as GPF mentioned, he HAS done much to champion many good and worthy causes in his long life. Okay...and NOW back to Doris! You should be a politician instead, Dargo! America's been desperate lately, lol. Lol. Maybe we can launch a write-in campaign and vote for Dargo. A lot of celebrities do this, especially now in this internet era. Of course, this does not just apply to fame but also money. There already has been an actor as president. The lines are blurred. I wish Me-Tv in my area had shown Doris Day like in other places. But I did get to see Send Me No Flowers. That was a bonus. While I know EXACTLY what you mean here Eugenia, I'm not so sure I'd get all that any votes if I'd ever throw my hat into any ring. People don't like it when ya hold a mirror to 'em and tell 'em THEY might be part of the problem, and that it's NOT always "those other people" who are to "blame" for all the problems they see in the world. In FACT, I could probably ONLY count of MY vote and that of my "Ma's"! And she CAN'T vote because she's CANADIAN! Ya know Speedy, BESIDES a terrific Kirk Douglas impression, I can do a pretty mean LBJ impression TOO! Well, MY guess is that might have had somethin' to do with that thought that with Kirk, a notorious Hollywood c-o-c-k-hound(I placed those dashes within the spelling of this word in order to circumvent any possible "filtering" done my our "Mr. Otto Censor" around here) during this time in his life, MIGHT have maybe come on to Doris during this flick's filming, and then MAYBE Doris wasn't interested in such a fling, and so Kirk's ego might have been a bit bruised afterward. And thus with Kirk being one who was prone to react in, lets say, a less than gracious manner when hearing the word "no" said to him, he might have placed Doris on his little "persona non grata" list. You see, I BASE this little "theory" of mine on a little incident I once had with Mr. Douglas at LAX and when I worked as a boarding gate agent back in the late-70s. Yep, I still remember the time the guy walked up to me at Gate-62 and said he expected his wife to be arriving on a flight which was due to arrive in about 20 minutes and asked me check the passenger list to make sure she was on the flight. When I advised him that I was sorry but I couldn't do this for two reasons, one being that airlines had a strict policy about giving out such information to others because of a lawsuit another airline had lost when this sort of information HAD been given out to another(an incident in which a wife had been given this information a few years prior and in which she went to the airport to discover her husband arriving on this inbound plane arm and arm with another woman), and the other being I didn't have immediate access TO the passenger list of an inbound flight, well, THAT was when Mr. Douglas got, lets say, "a little ugly" and did NOT handle my negative reply to him as graciously as one might THINK someone would, and ESPECIALLY after I took the time to inform the man WHY I could not comply with his request. YEP, you guessed it! The guy then replied to me with that "classic" ol' line, "You DO know who I am, don't YOU?! ", and I then replied back to the man, "OH yes, Mr. Douglas, I KNOW who you are, and I'm a big fan of yours TOO! But sorry, as I said, I can't give you the information you seek", and that's when the guy gave me one of his patented tough-guy stares and walked away grumbling. I've never been a particular fan of Kirk Douglas. But I gotta tell you that I absolutely believe everything you say about him and it sounds just like the guy I remember from live television. I'm of the age that I've seen all the old movie stars on The Tonight Show, the Mike Douglas show, the Merv Griffin show, I can go on and on. And every time I would see Kirk Douglas he was an egomaniac, selfish egocentric oh and I don't have enough adjectives to say how much I couldn't stand him. His peers were nothing like that on live TV - - I'm talking about Richard Widmark, Lancaster, Gregory Peck, William Holden, need I go on? I'm surprised he was ever able to get his mind off himself to make a movie. Anyway Michael Douglas seems alright because I know Kirk didn't raise him anyway. The only thing I remember liking that he was in was Martha Ivers and Barbara Stanwyck and Van Heflin topped him out in that one anyway. Heck, even Darryl Hickman topped him out in that one. But before his fans come after me, I've got to say Minnelli showed another side of him in Lust For Life and it was it was good. But I think Minelli showed the real guy with Bad and the Beautiful. All apologies to his fans - - if it makes them feel better they can say something nasty about Richard Widmark and William Holden. So be it. Or as the French would say Ainsi soit-il! I love this photo of Doris in Young Man with a Horn because she looked a bit boyish. 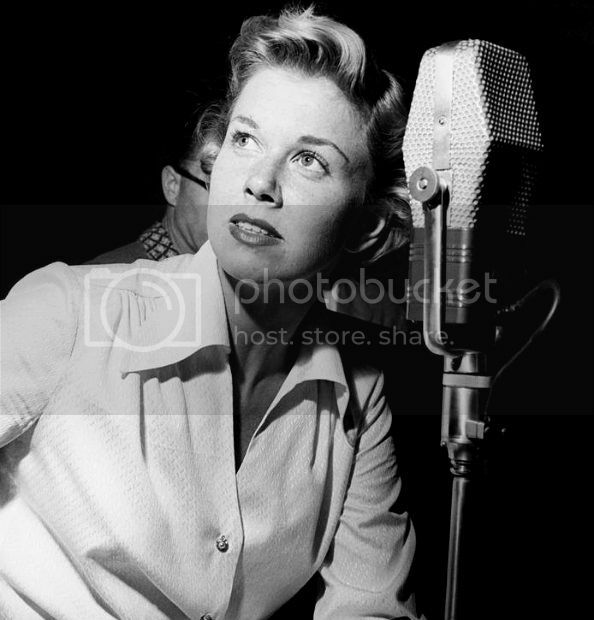 Doris was also known as "The Tomboy with the Golden Voice" in the early 1950's. Everybody loves a lover and I love Doris Day! Dargo, I wrote "in a good natured way," and I was the one who brought up his humanitarian efforts. My post wasn't meant to bash your post only to bring up the fact that Kirk and his wife are 2 people who have used Kirk's fame and fortune for the betterment of people all over the world. That isn't something that most know about. Kirk doesn't and hasn't bragged about what he and his wife have accomplished. They set that foundation up many years ago and they have given millions of their own money for worthy causes. A belated Happy Birthday to Doris Day! I'm in the middle of her biography by David Kaufman and learning so much about her life i didn't know. I do know she's done so much for dogs and other animals, for so many decades. I hope she was surrounded by her beloved four-legged friends on her special day. In my encounters, it is the employee who initiates the encounter, while I am minding my own business. For example, I was in a Trader Joe's last week. They play music, and I was listening to a song under the only speaker that worked. The guard came up to me and said, "You've got to keep moving". I rest my case. To complete the story, when I questioned him about his "policy", he said he was only doing his job. I went up to the manager, and asked him whether it was the store's policy to keep people moving. He didn't know what I was talking about. Fra-- what was the name of the song that you were listening to? 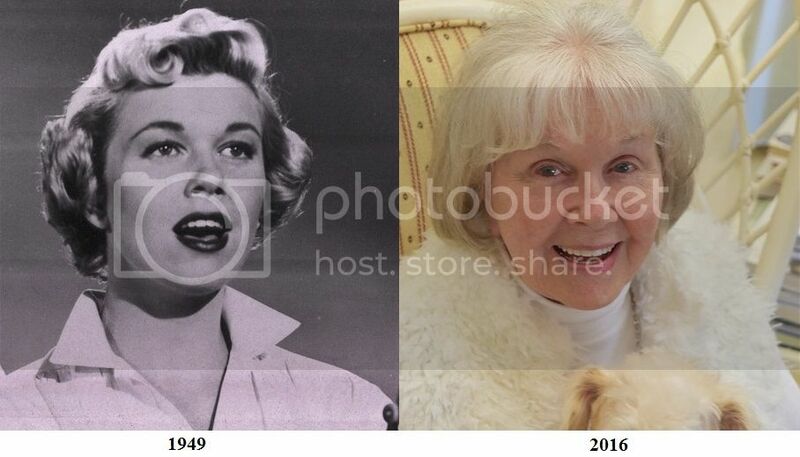 Exactly what year was Doris day born; 1922 or 1924? Different sources state one year or another. Does anyone really know the correct year? It's Doris Day against the U.S. Census. Who do you want to believe? "Born 1922: age on April 10, 1940, in Hamilton County, Ohio, 91–346 (enumeration district), 2552 Warsaw Avenue, was 18 years old as per 1940 United States Census records; name transcribed incorrectly as "Daris Kappelhoff", included with mother Alma and brother Paul, all with same surname." I very recently finished this same book, GayD. I found it very balanced and well-written and I recommend it to others who'd like to find out more about her. GayD and Genie, by any chance did either one of you read Doris Day, Her Own Story ? Doris collaborated with AE Hotchner for this book. I've read this one and wonder if the one you bothread is much different than this biography/autobiography that I read. I enjoyed the one I read. Her Own story was written in 1976 so I would imagine that the info in the book you guys read probably went beyond that. She's a favorite of mine and I'd be interested in reading another bio of Doris. I haven't read this one, lav. I remember your recommending it to me, but unfortunately it's not available at my library. I guess I could try to pick up a copy on amazon... The one that I just read is pretty comprehensive, though. Performer Scott Dreier recorded that song along with Jane Monheit. It's on a CD he recorded of Doris Day songs but it has yet to be released (one of those recordings paid for by online contributions) He performed his show at Cypress Inn over the wknd.